Now I got a lot of heat on an earlier post about solar panels, so I want to be clear up front that I have nothing against tankless water heaters (BTW, they are “water heaters” not “hot water heaters” – the water starts out cold!). The problem I have with using them is that they are just a part of the hot water system, and they won’t work efficiently as part of a green home unless the entire system is designed and installed properly. We’ll get into the specifics of tankless heaters shortly, but the most important thing to understand about efficient water heating and efficiency is that the design of the system is much more important than the heater. 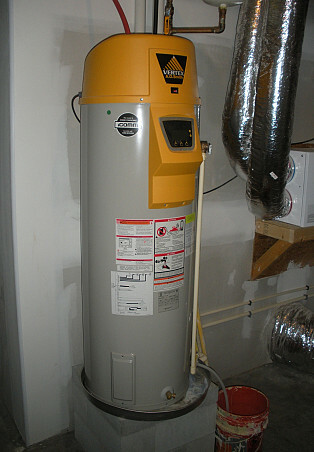 The most super efficient heater will not make a poorly designed system efficient, and a well-designed system can be quite efficient with a standard water heater. Hot water systems need to do three things to be green: first, they need to deliver hot water to the faucets while wasting the least amount of water waiting for it to get there; second, they need to heat water efficiently; third, they need to keep the water hot when it’s in the pipes for as long as possible. Delivering water quickly is the toughest challenge, so we’ll save that for last. 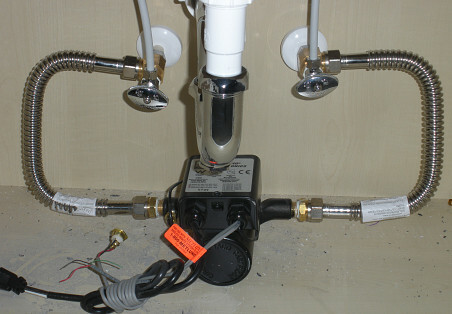 Heating water efficiently involves selecting the right heater. All water heaters have an Efficiency Rating (EF) that you can use to compare different models. 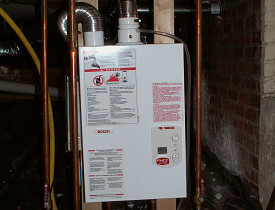 Most tankless heaters are very efficient as are some tank heaters. Tankless heaters are generally more efficient than tank heaters, but that is mostly due to the fact that they are not reheating water that is allowed to cool in the tank. If you have a large family that takes a lot of showers, it's unlikely you'll lose much energy from water stored in a tank heater. OTHO, if you travel a lot and take most of your showers at the health club, a tankless heater will be a more efficient choice. To keep the water hot in the pipes, insulate all the hot water lines with insulation as thick as the pipes, taped and sealed at all connections. To get to the most important point, the system design, the water heater should be as close as possible to where the water is needed. This really is a design problem, from making houses smaller, to providing a place for the heater, and running the pipes in the most direct route. Many big homes have water heaters in the garage with the master bedroom all the way across the house, taking a long time to get water there. One solution to this plumbing challenge is to put several smaller water heaters in different places in a large house, each one close to the bathrooms. Another solution is to use what is called a "demand pump," which pushes or pulls the hot water to the fixture when you press a button or activate a motion sensor. It gets the water there much faster than running a faucet and doesn’t waste any water in the process. It shuts off as soon as the water arrives. This is in contrast to full time circulation pumps which, although they save water, waste a lot of energy heating and reheating water all day and night when it's only used for a few minutes at a time. So before you start worrying about your water heater, make sure you have done everything you can to make your hot water system as efficient as possible. Carl Seville of Seville Consulting writes for Networx.